Conspiracy theories--everybody has one. The difference with this conspiracy is that it's all too real. David Baldacci's The Camel Club takes readers inside the Beltway as four unlikely misfits struggle not only to survive, but to save their president and their country from a plot that will lead to nuclear disaster. Spend a little time at a shooting range. He says some silly things about guns. In Absolute Power the shooter liked to use a .460 Weatherby Magnum. Silly! And in Camel Club the guy is wasted with a .22 revolver loaded with jacketed bullets! Huh? Then there is the deal about two guys carrying an unconscious victim a considerable distance in a tarp. Just try it. And then one pulls a boat out of his pocket big enough to carry the three of them and, by the way, has an amazing silent motor to power it. Tom Swift stuff. Nobody loves a conspiracy theory more than me. But not this one. Mainly because its not a thriller so much as a thinly disguised attempt to tell us we really are the Great Satan, and that Americans would be better off with a Socialist government, and that peace is attainable only if we give half of our wealth to the Muslims of the world. 1. The world's resources should be doled out equally to the world's inhabitants like a plate of Grandma's tasty pastries, because she'll never make another one, and that's the only fair thing to do. 2. Good decent Muslims only came to hate us because of Iraq. 3. But for the first two points, there would be peace in the middle east. 4. Mentally deranged geniuses and hobos can save the world, without telling anyone. 5. Our government officials, gloating over our superiority, are kept from raining nuclear weapons on the world without provocation only by the slimmest of fortuitous events. The Camel Club has an unnecessarily confusing beginning, a tediously, plodding middle and finishes so abruptly and implausibly we're left with the impression Balducci either tired of writing or his editors forced him into a timeline. In the last 100 pages, we're introduced to new characters of such malicious, evil stupidity that the whole book could have been written about them. Here they are only used to bring some strange and bizarre ending. In the Camel Club, we give Balducci virtually 600 pages of our precious time to prove why Americans are at fault for 9/11 because we really are the Great Satan. He does a terrible job, and ends up revealing the argument for the tragic parody it really is. The Camel Club is cool! The Camel Club is cool. They're an odd group of conspiracy theorists, led by Oliver Stone, on a quest for the truth. Baldacci weaves quite a tale that keeps your attention and is full of twists and turns. I thought this was a great mystery thriller with a bunch of interesting characters. If you see the name James Naughton on an audiobook you can count on a noteworthy performance. Actor, singer, director; he can do it all. He's a two-time Tony Award winner (Chicago and City of Angels), plus his debut solo album was recorded in 2003. Naughton directed the production of Our Town starring Paul Newman for Broadway and PBS. Now, if he directed Paul Newman, you know he has to be better than good. If you need further proof, don't miss hearing his narration of The Camel Club. I've listened to it twice and would happily do so again. His voice is distinct, deep, resonant. His reading is almost understated as he narrates with calm confidence as suspense mounts. It would have been easy to over dramatize the following intense opening lines - Naughton doesn't make that mistake. In modulated tones, letting Baldacci's words stun we hear: He was running hard, bullets embedding in things all around him. He couldn't see who was shooting, and he had no weapon to return fire. The woman next to him was his wife. The young girl next to her was their daughter. A bullet sliced through his wife's wrist, and he heard her scream. Then a second bullet found its target and his wife's eyes widened slightly. It was the split-second bulge of the pupils that signaled death before one's brain could even register it. As his wife fell, he raced to his little girl's side to shield her. His fingers reached for hers but missed. They always missed." So begins David Baldacci's tense story of four men obsessed with conspiracy theories. They meet one evening on an island in the Potomac River. The group, led by a man who has taken the name of Oliver Stone, had intended to share ideas. So much for good or bad intentions. They witness a killing, staged to look like a suicide. Before long they join forces with Secret Service agent Alex Ford to combat an evil that would cause ultimate destruction. There have been odder heroes but few such compelling scenarios as Baldacci laces his narrative with contemporary issues and events, all of which serve to make his chilling premise alarmingly real. 1) You'll encounter secret service agents that evidently need to explain the mundane details of their protocols to each other. 2) You'll hear a clerk at the Library of Congress explain the book viewing process in painstaking detail to a guy who goes there routinely. The other guy doesn't ask him to hurry up. You may roll your eyes. Probably more than once. If eye-rolling isn't your thing, you might just sigh and beg Mr. Baldacci to "GET ON WITH IT!" There are a good number of interweaving plot lines, but the paper-thin characters can make it very easy to find onesself asking, "Who are we talking about again? Is this the blond guy from the NSA or the brown-haired dude from the CIA or the red-head from the PTA?" Please don't expect a whole lot of action prior to Chapter 20. Or for a few chapters after that. At least the words are small and clip-clop along at a brisk pace. Forced myself to finish this book. I only bought this book because I mistakenly picked up Stone Cold not realizing it was a series. I started reading it and felt like I was missing something so I looked online and realized there were 2 books I should have read before reading Stone Cold. Anyways, I never would have finished this book if it wasn't part of a series. I forced myself to read it because from the little I read of Stone Cold I was hooked and I wanted to get to know the characters so I wasn't confused about who they were. I can normally finish a book this size in 2 to 3 days. This book took me 2 weeks to finish. The storyline is confusing and all of the abbreviations made my eyes cross. I had trouble keeping certain characters straight. It was just a long, drawn out book that needed to be shortened and simplified. Really the only reason I'm giving it 3 stars is because I love the characters. Olive, Reuben, Caleb, and Milton are refreshing and insightful. I enjoyed their personalities and different quirks. Milton's OCD had me laughing and feeling incredibly empathetic for him. Reuben strikes me as a giant teddy bear who would do anything to protect the one's he loves. David Baldacci's Camel Club introduces us to the quirky fun characters that give the book its title. The fact that the "club" lives on through 3 subsequent books illustrates that this is a winning formula. The Camel Club is a group of eccentric middle aged men who enjoy meeting and investigating conspiracy theories. They happen upon a murder and are quickly thrown into the middle of the biggest conspiracy theory of them all. Great intro to a series I hope to enjoy. I very much enjoyed the book and its characters. As a hack writer, I appreciated that the main characters are flawed and realistic. Often the main characters become invincible and unbelievable, have an answer for everything... and ultimately lose me. Villains in the story (Hemingway and Gray) share this "super" quality, and that was unfortunate, but not enough for me to put the book down. If I wanted 100% believable details I wouldn't be reading fiction. Good story. Good characters. Fun read. David Baldacci manages to tell a serious story against the backdrop of the nation's capital in a sort of different way. 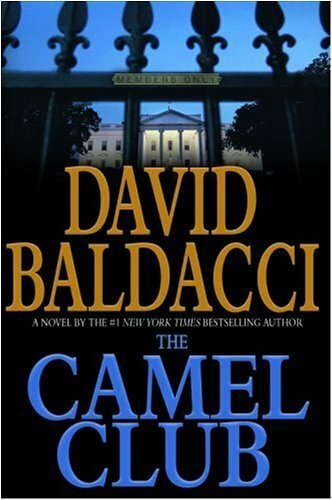 In 'The Camel Club,' Baldacci introduces us to several friends who make up the Camel Club, a small club that is dedicated to uncovering the conspiracies of the government. They are all interesting characters (the leader calls himself 'Oliver Stone') who start out investigating a murder that they witness. This plunges them headlong into a conspiracy at the highest levels. On the side, we are introduced to another group of characters preparing for something in the small town of Brennan,PA which is named after the fictional president that Baldacci made up. He gives you some details of what they are preparing to do, and you know that it's going to be something BIG. It takes two-thirds of this long book to set up the murder mystery by the Camel Club, and the events shrouding Brennan, PA. When the stuff goes down in Brennan, the book REALLY takes off. I won't spoil anything, but the story takes some major turns. Since the copy I am currently reading--at exactly the mid-point of the book--was found in a New York City subway car I can't complain about the price. This is the first David Baldacci book I've read, so I'll take other reveiwers' word that he has done better. I did not believe that anybody could match idiocy of J.Patterson's books, now we have a very strong contender in the field. Alex Ford is a Secret Service agent on White House detail with three years to go until retirement. He's tempted to coast the rest of the way through his career, until a "suicide" that seems too cut-and-dried has him asking questions. Oliver Stone is a protester who has a tent in the park across the street from the White house. He and his three friends know more about the death of Patrick Johnson than just about anyone, since they witnessed his murder. The FBI is willing to write Johnson's death off as a suicide, since it appears he shot himself, left a note, and drugs were found in his home, but Johnson's fianc¨¦e isn't buying it. Her suspicions have agent Ford and his rookie partner investigating and getting themselves in hot water with the Secret Service. Alex can't let it go, though, when suddenly several terrorists suspiciously kill each other off. He's demoted down to protection detail in Brennan, Pennsylvania, when the president makes a campaign stop in his hometown, but this puts him unwittingly in the middle of an intricate plot against the president of the United States. Alex doesn't want to listen, but Oliver Stone and his Camel Club hold the keys to unraveling the mystery and saving the world from World War III. The author can tell a pretty good story, but the plot here is on the far side of improbable. The problem is that he can't write worth a damn. The dialog is really bad - *nobody* actually talks the way his characters do. And the characters themselves are thinner than cardboard. Baldacci seems to favor the George Bush view of life - totally black or white, you're either with us or against us. Not to mention a few technical howlers. Baldacci mentions, over and over again, the devastating effect of "supersonic" rifle rounds. As far as I know, just about every rifle bullet (in fact probably bullets from most any gun) go supersonic. This book is lousy, and I'll never waste my time with Baldacci again. At least this one was loaned to me, so I didn't waste my own money. Held my attention to the end.